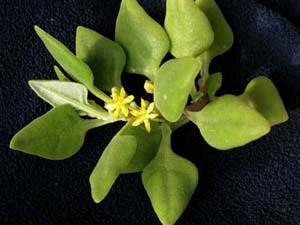 Tetragonia implexicoma (Ice-plant) is a very common native coastal plant. 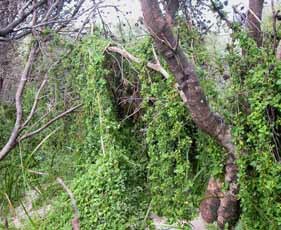 It grows on both rocky and sandy coasts and may be a scrambling ground cover or a scramble over coastal shrubs. 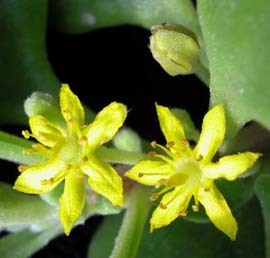 The leaves are more or less diamond shaped, are distinctly succulent and glistening on both surfaces. 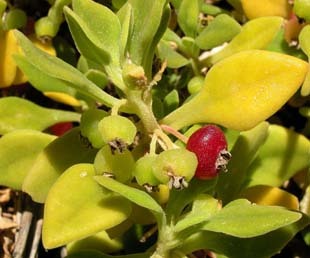 The flowers are yellow and the fruit is red and succulent. It is occasionally confused with Rhagodia candolleana, which however has smooth, glossy upper leaf surfaces.